Destiny Otubambo, a 27-year-old University dropout was arrested for reportedly buying a phone using a fake bank alert. It was gathered that on May 24th, the suspect purchased a phone worth N377,500 from a mobile phone dealer at Ikota shopping Complex Lekki, Ajah and generated a false bank alert which he presented to the phone dealer and claimed to have successfully carried out an online transfer. However the sales person didn’t receive the alert at that point believing it will reflect later, but collected the suspect’s phone number. Long after the alert wasn’t forth coming, they tried to reach out to the suspect but the number wasn’t connecting. At this point the attention of the Federal Special Anti-Robbery Squad (FSARS) was called, after much investigation, it was discovered that the account number the suspect claimed to have made the transfer from was a fake account and didn’t exist, the suspect’s lover was arrested which led to the arrest of the suspect. HOT : Why Davido & Wizkid Are Fighting? 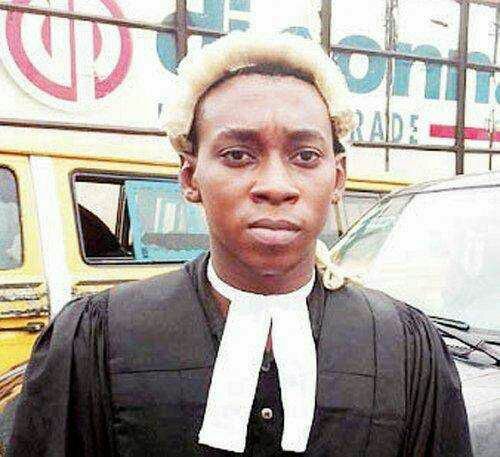 The Law dropout reportedly claimed to have sold the phone online, he explained how he generated fake alerts from original ones, the suspect was also seen with a lawyer attire which he claimed to have bought for a sum of N35,000 just to snap and upload pictures on social media.